Philippine President Rodrigo Duterte will allow Indonesian maritime authorities who are in pursuit of pirates to enter his country’s waters to capture them. “We can make it clear that if the chase begins in Indonesia and continues in international waters, and inside Philippine waters, they can go ahead and blast them off,” the firebrand leader said Friday. Mr Duterte was telling the Filipino community in Jakarta what he had told his Indonesian counterpart Joko Widodo at the recently concluded East Asia Summit in Laos. “That’s the agreement. Blow them up. That’s my word actually with Widodo. I said, ‘Blow them up’… and maybe if there are sharks around, then we can just feed them to the sharks,” he said at the lunch event at Shangri-La Hotel, the first stop of his inaugural state visit to Indonesia. His comments came just hours before he and Mr Joko signed an agreement to enhance maritime security in the South China Sea. Piracy in the sea lanes, through which more than US$5 trillion (S$6.8 trillion) in trade passes each year, is a perennial security bugbear. 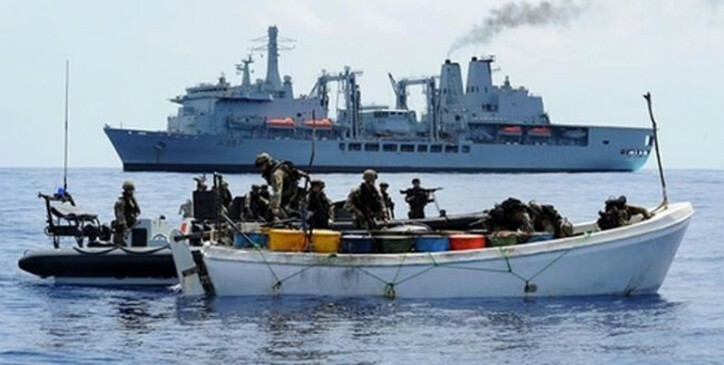 Recent cases of vessels carrying coal and crewman from Indonesia, Malaysia and the Philippines being hijacked by Abu Sayyaf pirates have prompted the three countries to consider joint patrols in the area. Calling piracy a crime against humanity, Mr Duterte said the agreement signed yesterday is a tripartite one which includes Malaysia. “It means that there will be some interdiction by their armed forces and the armed forces of the Philippines,” he said, adding that the leaders of the three countries “have decided to end this problem once and for all”. Mr Joko Friday (Sept 09) thanked the Philippines for its cooperation in ensuring security in the South China Sea. “We hope that there will be no more security issues in the Sulu Sea in the future. We will conduct joint patrols to ensure security,” he said. Mr Joko took Mr Duterte on one of his trademark blusukan, or impromptu visits, to Jakarta’s Tanah Abang textile market before the bilateral meeting at Istana Merdeka. The Indonesian leader noted the similarities he shares with Mr Duterte, who, like Mr Joko, is a former governor in his own home town. “We both always want to be around the people. We are not too uptight about state protocol, (which can) sometimes give headaches to the presidential staff and security officers,” he said at the start of the bilateral meeting. Mr Joko also wished the Philippines well as it takes over the Asean chairmanship next year. Mr Duterte said the ties that bind their two countries are “long and enduring”, and that “Indonesia is not only a friend but (also) a brother” to the Philippines. He also said after the meeting that the discussion was “very productive” and he was pleased that the two nations agreed to have more people-to-people exchanges, as well as cooperation on security, especially when both countries are under the constant threat of terrorism and violent extremism. The Philippine military is now on the hunt for Abu Sayyaf extremists who are holding five Malaysian hostages in the mountainous jungles of Jolo island. At least 25 Indonesians have also been taken by the group this year. Mr Duterte said he and Mr Joko would also join hands in fighting the “menace” of illegal drugs. “We agreed to work together to prevent, arrest and prosecute all those who seek to sow fear and terror in our societies,” he said. Earlier in the day, Mr Duterte denied directing an expletive at United States President Barack Obama during a press conference in Davao. He also defended his tough stance on crime, despite criticisms of his human rights record over widespread vigilante and extrajudicial killings since he became President. “I do not have any pity for them,” he said, referring to criminals, adding that he wants people to be able to “walk freely” in the Philippines.